What Type Of Truck You Are Going To Use The Fifth Wheel On? 2. Does The Truck Bed Has A Liner? 4. Are there metal rails on the truck bed that go from the left to the right? What Should be Your Biggest Concern When Towing a Fifth Wheel Hitch with a Short Bed Truck? Picking a fifth wheel hitch for your short bed truck could be a challenge, but once you get one, it will be able to offer you with many advantages as compared to bumper pull travel trailers. But you should also be ready for challenges as well. There are many hitch options which you will be able to pick from ranging from a slider, fixed, and auto slider. When it was my time to get one, I realized that there was a lot of things I didn’t know about the fifth wheel hitch and that is why I decided to help others out there who might be knowing little or nothing. Here are some of what I consider to be the best fifth wheel hitch for short bed truck. If you decide to buy this one, then it is going to convert your gooseneck hitch to a fifth wheel hitch without the need for truck bed rails. The only issue is that you will have to get the gooseneck from the B&W manufacturers, the one known as, Ball gooseneck turnover hitch. But I am sure you will not regret the purchase as it cleanly mounts using the under the bed system, leaving no marks of rails on your truck bed. You also have the option of removing the gooseneck ball and install this particular fifth wheel hitch, or you can leave the bed of your truck completely neat and clean, ready for use. The installation process is very easy and it will take you no more than 10 minutes. The hitch has a 20000lb rating with a tongue weight of 5000lb. 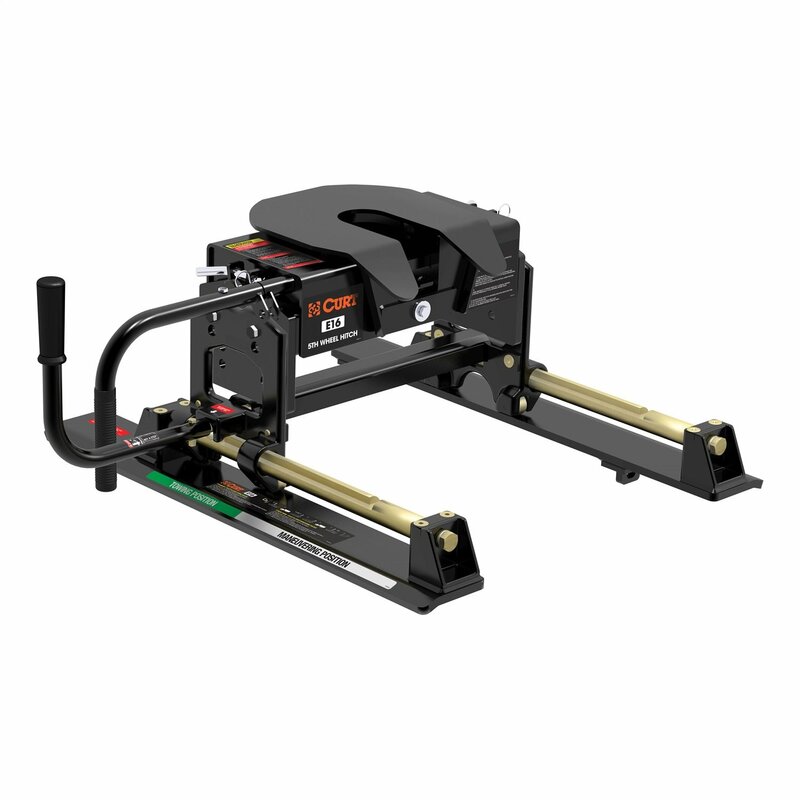 It has polyurethane bushings and double jaws to give you a great towing experience. It also has a lifetime warranty. The full freedom provided by the four-way pivoting head. A B&W gooseneck hitch needs to be available first. If you have a short truck bed and want a fifth wheel hitch to fit it well, then this might just be your pick. It is designed specifically to work with short beds, but it can as well fit on long truck beds as well as the standard ones. Most of the hitches available in the market are not compatible with short beds and thus, this might be what you have been looking for a very long time. When it comes to design and construction, it seems to be peerless. It weighs only 35 pounds, meaning, it is lightweight, allowing it to be easy to be lifted when you are doing the installation. There is an adjustable feature on the ball of this hitch. The coupler which it is housed on is grease free which means that you will work on it without having to become dirty or stained. Due to the fact that, the coupler is engaged to a ball, there is an improvement on the swiveling of the hitch, articulating in any direction, making the hitch to be unique. It also enables you to be able to couple or uncouple the trailer and the truck while you are on a ground which is uneven. It has gross trailer weight capacity of 24000 pounds and a tongue weight of 4500 pounds. It is a simple and strong hitch in construction. It has a ball funnel feature which ensures that you can be able to hook it. It is compatible with gooseneck hitches. 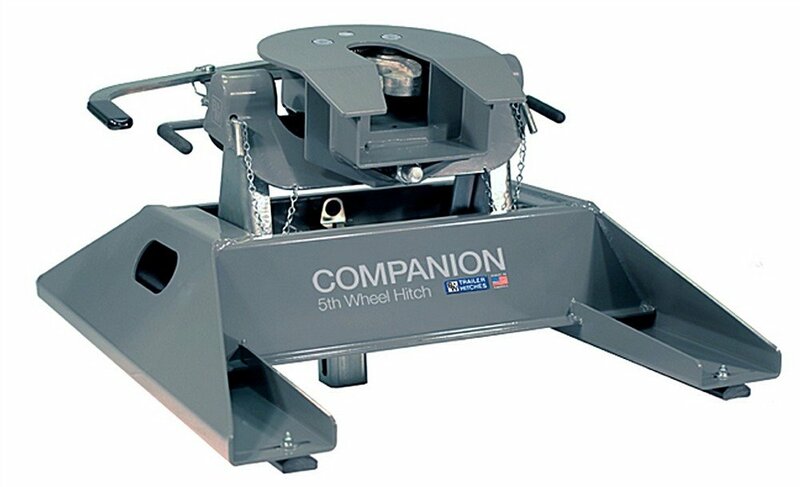 It is a lightweight fifth wheel hitch. I consider it to be one of the best fifth wheels because it comes with a GWT of 16000 pounds and for the vertical load, it can survive up to 4000lbs. This means that, if you decide to buy it, you will be assured that you can do a lot with its ability even though it is an economical option wheel hitch. It runs with an anti-rattle skid plate to give you a noise free and worry-free ride. It comes with a dual pivoting head, which will provide you with 10 degrees of lateral movement, thereby proving to be very flexible. 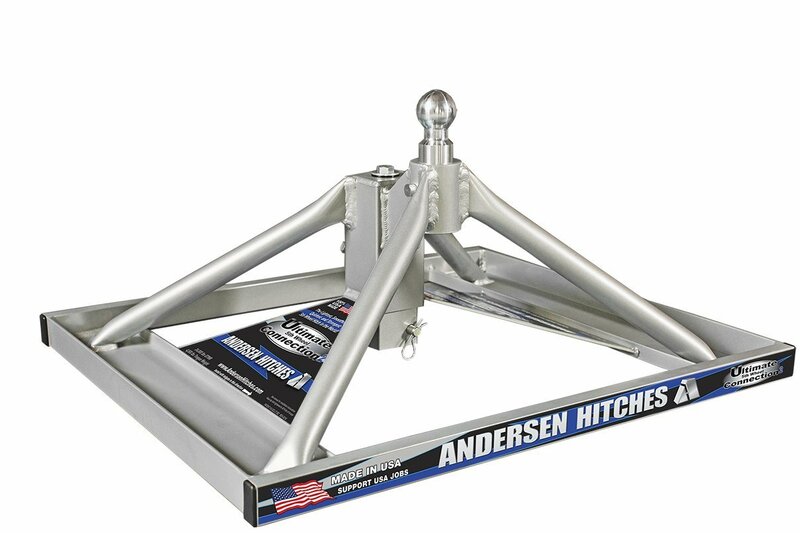 It is a versatile hitch which can easily adapt to truck beds that are unique, making it be versatile with different heights in regard to truck beds. You can easily operate it single-handedly. It comes with an auto-locking mechanism for a straightforward and secure coupling. It is long lasting due to the carbide powder coat which is durable. If you have a short bed truck, this might just be the hitch for you. Its gross trailer weight capacity is at 16000 and I believe it is sufficient for small and medium trailers. It has dual axes which make it possible to pivot sideways for at least 10 degrees. The trailer movement is regulated well, even when you are passing a sharp curve. It comes with an automatic locking system for safer and quicker connection. Using a single handle, you will be able to operate it. For anti-rattling capability, it comes with a specialized plate, meaning, even when the road is rough, you will travel noise free, having a smooth and quiet ride. If this is your pick, then you will never be disturbed by towed trailer or the hitch while on the move. Its assembly is also impressive. It seems to be compatible with most of the standard base rails for easier installation and mounting. It also comes with a height adjustment feature to make it possible to accommodate various truck beds. It is compatible with mounting rails that are standard. It is compliant with various safety measures. It has a robust and ultra-rugged design. Its lock hatch is not a common claw type. It comes with an interactive color code which is very unique, and it is located on its indicator, it’s reminiscent the traffic lights. It is strategically engineered to tow your trailer with as little noise as possible. Its bearing is designed with a spherical axial and has a unique pivoting mechanism which allows the coupling and the head to lean in the direction which you want it to, and in the process, you get a smooth ride. There are three grease fittings allow for continuous lubrication located on the hitch head. Its rubber stoppers are thick enough to act as a cushion when you start moving. It is a hitch which can accommodate 40,000 pounds of weight and the good news is that it is compatible with various mounting options. It is important to also know that, this fifth wheel hitch for short bed truck has a short throw, and you can use a single handle to operate it. Its jaw provides a 360-degree contact to enable your movement to be noise free. You will be able to tow your vehicle with less or no noise at all. This particular fifth wheel hitch is what I bought two weeks ago and it is doing just fine. I was at a loss as to which one of the many hitches in the market I should go for and after consulting with my friends, I decided to settle for this particular one. It is a hitch which fits the standard base rails of the industry. It is designed for towing those big rigs. Its trailer weight gross is at 18000 pounds, and this is what makes it perform more than other hitches in its category. It is fully automatic and performs perfectly well for me yet I bought it at a reasonable price, fitting well on my short bed truck. It has a four-way pivoting head that has a tilted side of 5 degrees to enable it to have an easy hookup. The slide bar jaw has a rounded mechanism, making it to automatically latch. The product also has a mounting kit, making it be convenient. When it comes to installation, it is very easy to do it on your own without asking for a helping hand. It comes with a three-year limited warranty. When it comes to price, comparing it with products with similar features, it is affordable. While it is easy to install this hitch, it is also very easy to unhook it. It is capable of accommodating 15000 pounds of weight and its weight is 75.5 pounds. Something else you will benefit if you decide to buy this product is that it has slide bars which are designed with strength and the rails are also constructed from standard quality. It has been engineered to high standards to enable it to eliminate the fussiness and risk of being able to tow trailers which are large. If you buy it, you might be able to get a smooth time while you drag it on the road irrespective of the type of road it is. It is sturdy and durable, able to withstand constant harsh weather and punishment. If you like traversing off-road, then it might just be the best option for you due to its high load capacity and ruggedness. It has a 20000-pound gross trailer weight rating with a vertical rating of 5000 pounds. These numbers mean that it is a fifth wheel hitch which can work with large trailers and RVs. The entire hitch has a wide stance, meaning that, while coupling, it will be able to provide stability with the jaw wrapping the kingpin perfectly, thus, eliminating shabby starts and stops. Wherever you go, if you choose this particular hitch, it might provide you with a smooth ride. Provides stability and strength of high quality due to its wide stance. 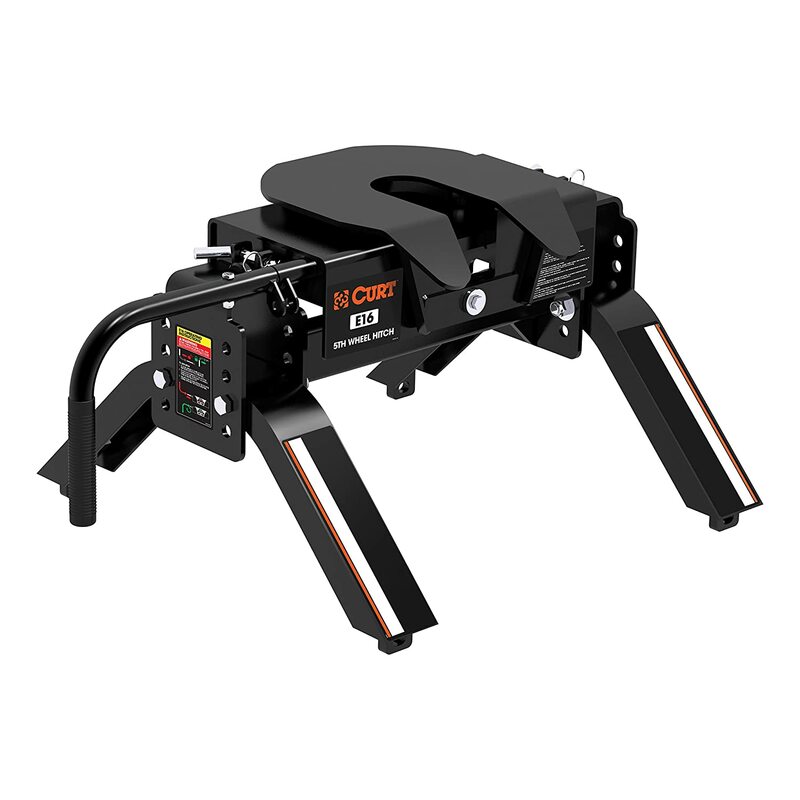 For the pin weight that has 14 inches by 18 inches vertically and 4-inch adjustment allowance from side to side, it has a capacity of 18000 lbs. It comes with an extended length handle which is capable of being locked and handles that are ¼ to mount system which has a quick to lock, thus lessening the slop as compared to pin mount system. It has a stamped head, which pivots in 4 ways and a kingpin which is 9 inches wide. If the truck bed is shorter than 6 feet, then it will not be able to fit unless you use a sidewinder. If your truck has a side to side flare, then this particular hitch will not fit. It comes when it is already pre-assembled and thus, it will save you some time of about one hour. It comes with folding tab washers that make it possible for you to have an easy installation. It weighs 137 pounds and has dimensions of 36.8 x 20.5 x 18.8 inches. Pulling in and out is very easy meaning, it is also easy to connect. It is easy to engage and to release without having to produce any sound. My Father bought this particular fifth wheel hitch last month and it is working great for him. It is designed to haul trailers for a long bed pickup truck. Its weight capacity is 15000 pounds with a tongue weight of 3750 pounds. It has a 4-way pivoting head, which can be adjusted between 13 inches to 17 inches. Something great about it is that, it comes with a complete kit and thus, if you choose it, you will not have to worry about buying separate parts. The kid also includes 30035 10 bolt mounting kit. So if you are looking for a fifth wheel hitch that has an easy and simple setup, then you could do well if you choose this particular one. You can use it for long drives and it might be great for the money you pay for it. Slider fifth wheel hitch: It slides backward and forward, in the truck bed, providing a ride that is optimal when going straight and when maneuvering, optimal is turning angle, thus, preventing the trailer from hitting the cab at night when passing through turns that are tight. Hitch Coupler: This is the flat part of the hitch which you will find in the bed of your truck and it is the one which will interface with your fifth wheel trailer. When assembling, you can either weld or bolt to the truck frame. Kingpin: It is the part of the hitch which is attached to the fifth wheel trailer permanently. It allows the RV to pivot when towing is happening due to the fact that, it is connected to the hitch coupler. Mounting rails: They are normally locked securely to the truck bed and you will need them to attach the fifth wheel hitch to the bed of your truck. The coupler of the hitch attaches to the mounting rails. Hitch Locking Leveler: it is the one which locks down on the bar which is used to release the receiver from the pin box of the fifth wheel. To prevent the fifth wheel from detaching, you will require a lock. Extended Pin Box: When towing with a short bed truck, you will require this device as it prevents your trailer from hitting the cab while making tight turns. It is best to know in details, what a fifth wheel hitch is all about. It is known to be a device which is able to support the weight of a semi-trailer, attaching to a truck. You will need to ensure that, it is well installed to prevent accidents from happening due to the fact that, the heaviness of the trailer will press down between the cab of the truck and the rear axle. You will need to know the overall weight that your truck has which include the gear inside the trailer and furniture. If you end up buying a hitch which will not be in a position to support your trailer weight is very dangerous and useless at the same time. So make sure that your decision to buy the best fifth wheel hitch for short bed truck is based on this. Remember that, it is serving as a link between your truck and trailer. When you get a fifth wheel hitch, it will bring along with it, so many benefits, one of them is that you will be able to have a significant way of supporting any type of trailer. Due to the fact that you can easily detach it anytime, you don’t want it on your truck, it follows that it is a convenient add-on. It can make you utilize your trailer for other purposes. 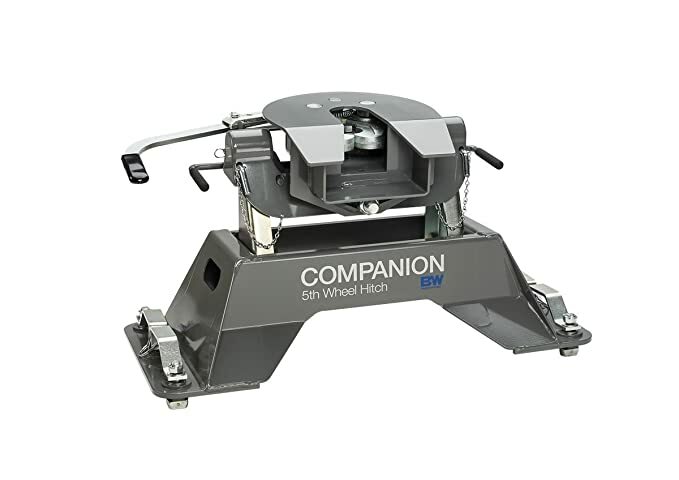 If you purchase a high-quality fifth wheel hitch, then it will be able to protect your trailer and at the same time, it is going to guarantee that, it will come with fewer weight limitations which will work out to your own advantage as you will be able to carry a lot more for a very long time. If the truck bed is more than 8 feet, meaning, along with the truck bed, then you can go for the traditional fifth wheel hitch. If it is less than 8 feet, then, there will be a need for you to consider buying an extended pin box and a slider fifth wheel hitch for the best results when towing. If you installed the fifth wheel hitch well, then it should be able to sit in front of your truck’s rear axle. This is easy if you have a long bed truck, but not with a short bed truck. 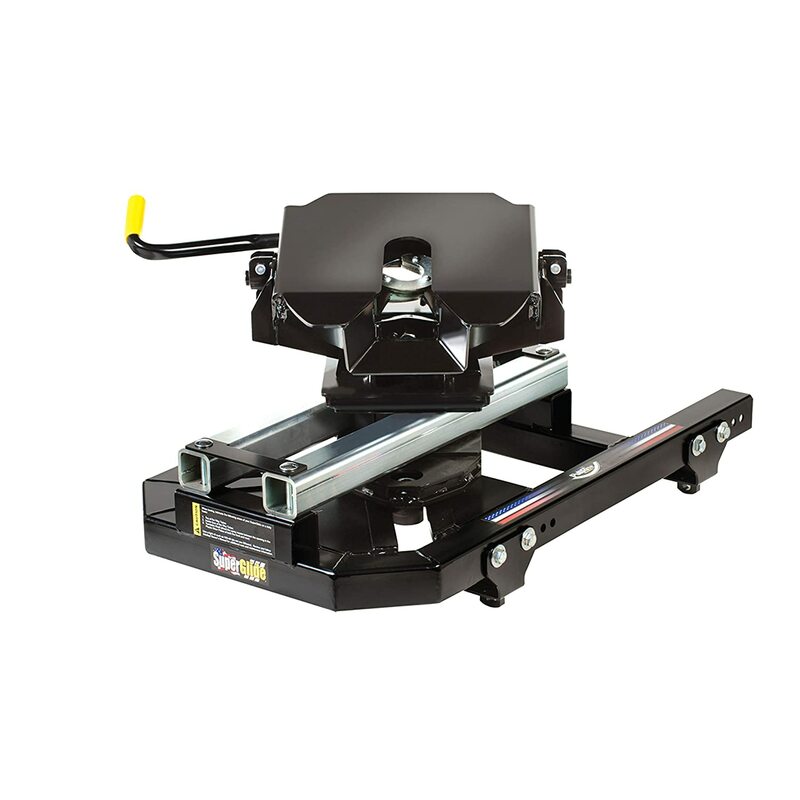 If it has, then there will be a need to cut a hole in order to accommodate a fifth wheel hitch and at the same time, be prepared not to utilize the slider hitch as it is not compatible. If there are, then you will need to get a fifth wheel hitch which is designed to attach to them. 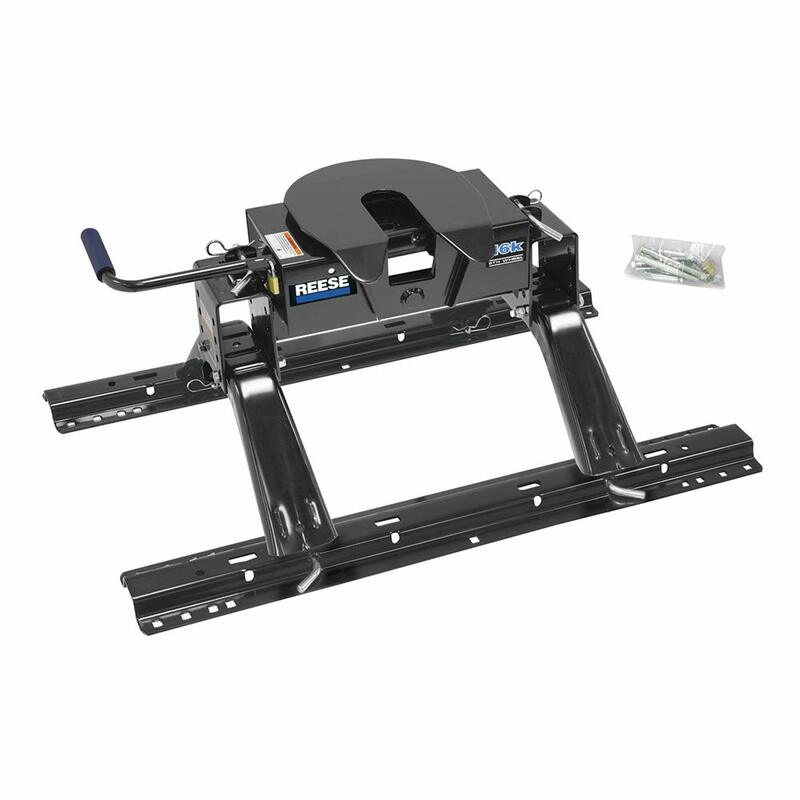 If that is the case, then you will have to get a fifth wheel hitch rail and also a hitch that is specifically designed to fit on them. It is possible to get a hitch that is specifically designed for your truck’s Model, Make, and year of manufacture. If not, then you can consider getting a universal one. If you have a truck with a bed under 8 feet, then you should consider getting a sliding fifth wheel hitch. Compared to the long bed trucks, the rear axle on a short truck is normally closer to the cab. Since the hitch will have to be directly over the rear axle due to safety measures when you are traveling, it denotes that, the trailer has to be closer to the cab on short beds as compared to long beds. If you decide to use a fixed position fifth hitch on a bed that is short, it might end up causing the corner edges of the trailer to collide with the cab of the truck when it is going through a bend that is sharp. Although most of the truck nowadays features rounded front caps, this doesn’t give you the full turning radius possible. And thus, you will have to go for a slider hitch which will allow for temporarily sliding towards the truck’s rear thereby creating more space for the trailer. It can allow you up to 90 degrees. Once you are done with the low-speed extreme maneuvering, the hitch can return back to its closer and safer position as you travel. First, you will need to stop the truck and then pull the slide release lever. Get into the truck and pull forward until you hear the hitching locking into place. Stop the truck and pull the slide release lever. Although it sounds a simple procedure, you will need to get in and out of the truck whenever there is a need to slide the hitch around. There is also a possibility that, you might have the hitch in the wrong position. The first time you do this, the sound of the hitch will be a bit jarring. It is generally less expensive as compared to automatic sliding hitch. Due to the fact that it is manual, there is a possibility that, you will have a variety to choose from. When you have this sliding hitch, it engages automatically and thus, no need for the stopping, moving the truck, pulling the slide release lever, hopping back out, hopping back in. It might be among the best sliding fifth wheel hitches. They are loaded with the latest innovation, which addresses the disadvantages of manual sliders. The pinion and rack which comes with this hitch allow it to auto slide on turns whenever the need arises and return back to the axle position once the turn is totally complete. There is nothing you are going to do on your part as the truck driver. And even though it sounds amazing, if you are on a tight budget, you should know that it is a bit expensive and it is weightier as compared to the manual sliding hitch. When it comes to a selection, then it means that you will have fewer to choose from. So it is up to you to decide which way to go. If you decide that you want to get a traditional fifth wheel hitch, then there are a few things which you need to remember. It is important to think about going down the road where there is no smooth road and thus, your hitch will be jostled and bumped along the way. There are two main types of fifth wheel hitch which are referred to as traditional: air ride and standard fixed. It has no cushioning and it is fixed in place. To ensure that the effects on off-road are minimized, you can get padded pin boxes. The advantage of this particular type is that it is inexpensive and the pin boxes can be used on a variety of trucks. The downside is that, still, you will be able to feel some bumps as you move along the road. It is an all in one system which cushions against the bumps as you ride along off roads which are mostly rough. It is a high-quality anti-shock system, but you will need to be ready to spend more. It is also heavy, and it might be tough to move it from one truck to the next. If You have your truck and towing system for a gooseneck trailer, then you can just get an adapter which will enable you to pull your fifth wheel. Some adapters will use the ball hose of your gooseneck hitch or your gooseneck ball. This will make it possible for you to hook up your fifth wheel hitch without the need for modification. Other adapters will need to be mounted on your trailer, allowing you to attach your trailer directly to the gooseneck back that is on your truck. 1. Adapter that you will have to attach to a gooseneck ball in the truck: It is one of the lightest hitch options that are available in the market. There is a high attachment between the hitch and the trailer. This relieves stress on the pin box and the trailer frame. 2. An adapter which replaces the trailer pin box: If you get this particular adapter, it will leave your truck bed open so that you can use it for other purposes. It is specifically made to fit certain pin boxes. You don’t have to worry about causing extra stress to either the hitch or the trailer frame with this particular adapter. 3. An adapter which bolts to the kingpin plate: If you are looking for a temporal solution, then get this particular adapter. You should be ready for the stress it will cause on the hitch and the trailer frame. 4. The adapter which is installed in the ball hole of the gooseneck hitch: For this adapter, there will be no need for modification of the trailer and thus, a good choice for you if you desire to switch between fifth wheel and gooseneck. You will need to be careful and learn the difference so that, you know which one of them is going to meet your needs before making a purchase. 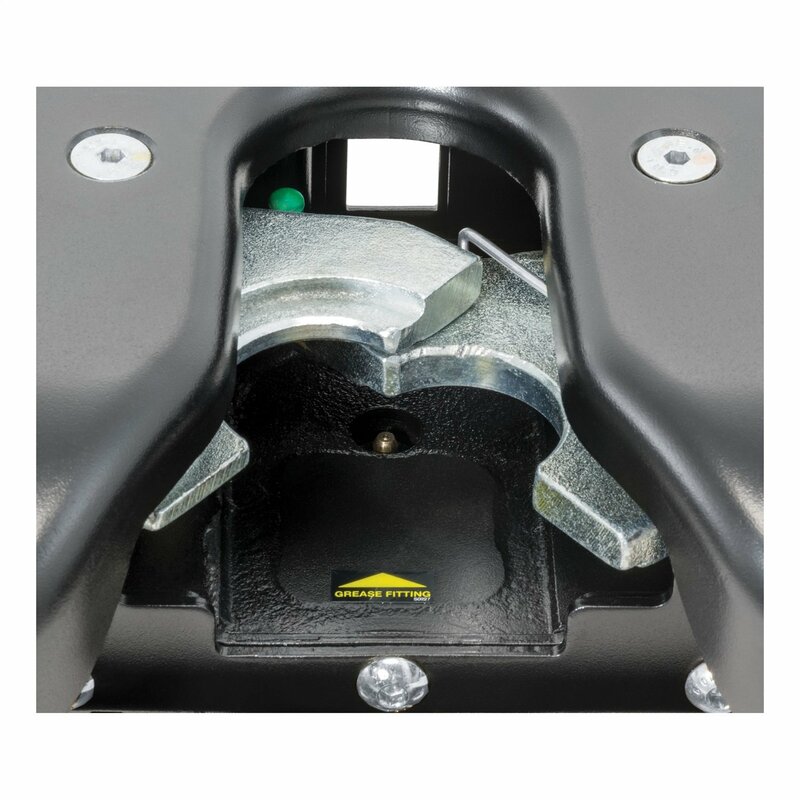 2-way Pivot Head: This is a regular fifth wheel hitch which works in two ways. Prior to the trailer reaching a grade change, it allows the truck to drive against an incline. Double jaw: It offers double the power and it can help you with the needs of your hitch due to the mechanism which is very powerful. 4-way pivot head: It is a fifth wheel hitch which will allow you to pivot from one side to the next. It is a hitch which will make traveling easier even when you are driving on uneven surfaces. Fifth wheel hitch with universal rails: It is a hitch which can be installed to any trailer. It is easy to install due to the fact that, there will be no need for drilling holes into the frame of the truck. Gooseneck hitch: You will be able to haul this gooseneck trailer with this particular hitch. By using the existing setup, you can be in a position to install it to the truck’s frame which later on, you can remove. Single jaw: This particular type offers grab jaw which you can easily use to connect to the hitch wheel by using rails. Fifth wheel hitch with custom rails: This particular hitch comes with a set of rails which are personalized. Due to the fact that, it already has drilled holes, it means that it is highly customizable. The following are some of the essential facts you will need to consider before choosing the best fifth wheel hitch in the market. You need to know what makes a good fifth wheel hitch. With the following, you will be able to make a great decision in buying the best. If you an incorrect hitch on a trailer, it might become hard and dangerous to drive around. You will need to ensure that, your hitch is one which will be able to accommodate the overall weight of your trailer. There is a need for you to ensure that your truck and trail match to allow for an installation that will be easy. You can be able to get units which you can easily install on your own without the help of others. You should also be able to get a hitch which comes with a complete installation kit so that you don’t have to worry about buying extra things to use for installation. The ones which are expensive may or may not guarantee that it is high quality. You will need to correlate the features of the fifth wheel hitch with its price in order to come up with a better option. 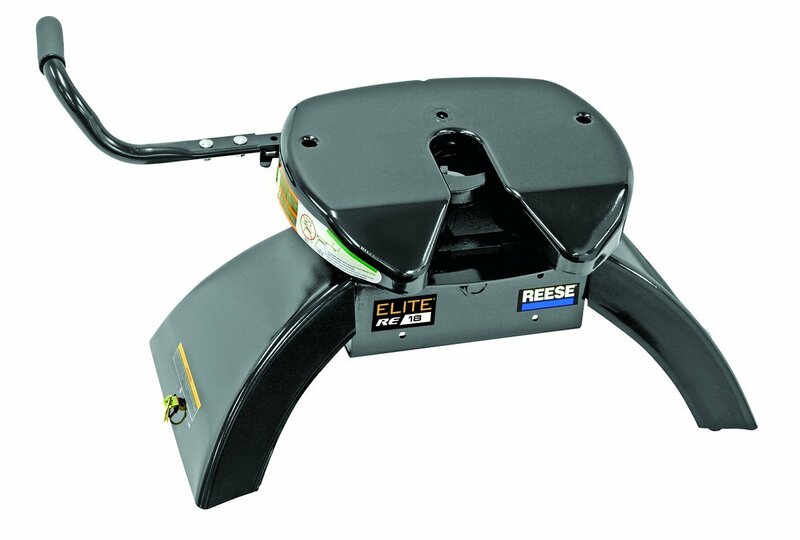 Get a fifth wheel hitch which will be convenient to use. Most of the units I have reviewed here will give you ease of use as you can disconnect and connect at will. Most fifth wheel hitches are made from fiberglass thereby ensuring that they come out with a glossy color and shine. Ensure that, it is in a position to carry out the required weight of your trailer. The turning angle should be your biggest concern. 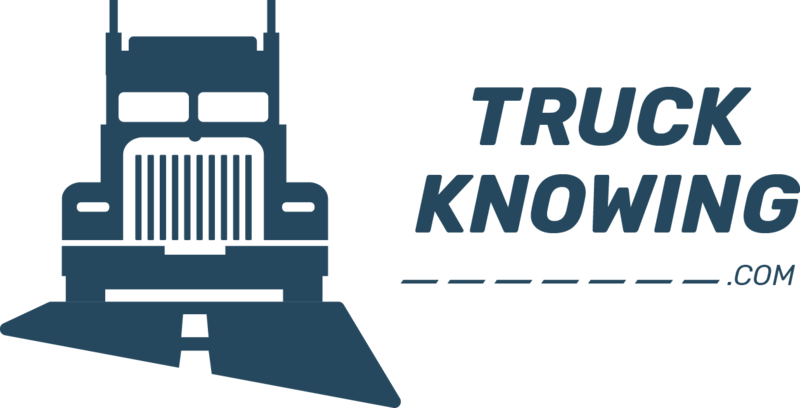 Until you have your trailer and your truck hitched up, it will be very hard for you to know what your turning radius will be. You will have to look at a few simple measurements which will help you to determine its performance with your truck. You will also need to think about the frequency you will remove it from your truck bed. Different hitch designs have different weights. The equipment you will install and your fitness level when it comes to installing and removing is likely going to affect your choice. There is no one perfect hitch that will make it in every situation. Hitches are available in different weight ratings with the lightest being around 15000lbs and the heaviest rated about 30000lbs. Most available manufacturers normally add 5000lbs as they move up. When you are selecting a fifth wheel hitch, consider your truck or the one you are about to buy and think about what you would want to have 5 or more years from that time. You are likely going to save money in the long run by going for a larger hitch than what you need at the moment instead of trading it in for your next fifth wheel hitch. When you make connections that are loose, you will end up having what is referred to as bucking and chucking. That is when you feel the RV pulling and pushing against the tow vehicle and in the process, causing an unpleasant bumpy ride. When the connection between the truck frame and the fifth wheel kingpin is not tight, the truck and the RV can move independently. When at the end the loose connection runs out as you travel, there will be a sudden jarring will be felt. If it happens while you are on a bumpy road, it might become impossible to stop without having to slow down. ISR kits make installation of the hitch very easy if they are installed in your truck bed as they provide a standardized rail system which is likely to work with various hitches. Depending on which hitch you have, with some being permanently installed and other removable from the bed, leaving the bed of the truck clear when the hitch is not in use. This option uses brackets which are normally installed in the bed to enable you to attach the hitch. Just like the ISR system, the brackets can be left in the bed whenever you remove the hitch when it is not in use. The shape and size of the brackets depending on the manufacturer of the hitch and thus, they are not interchangeable. It works similar to the puck systems from the factory installation. The hardware for mounting is attached to the frame and it has access holes which are drilled through the bed. During towing, the hitch is attached to the brackets which are under the bed. When you are not using it, you can easily remove the hitch and leave your bed clear of any obstacles. The performance of a fixed hitch of a fixed hitch varies greatly depending on the hitch quality. Most of the low-cost hitches tend to have a single jaw which locks to the king-pin on the trailer in place. If you get a more expensive model, it will most of the time, have a dual jaw system, meaning, it will provide a more secure connection. When choosing a fixed hitch, you will have to also look out for the articulating head, which is the one responsible for making it easier to hook up and unhook even when your truck is standing on uneven ground. The other difference between lower cost models and more expensive ones is the slop in the system. The best ride is obtained when the connection between the fifth wheel hitch and the truck frame is tighter. The turning radius is limited when you use a fixed hitch on your short bed truck. 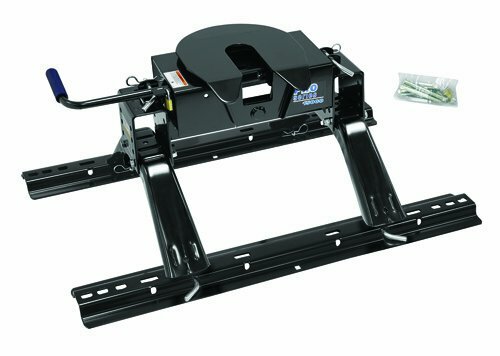 The fifth wheel hitch tends to be more maneuverable as compared to their bumper puller types as they have the ability to turn to more than 90 degrees. When it comes to a fixed hitch on a short bed truck, this is not possible. You might find it hard to get out of a gas station or even when at your campsite due to a fixed hitch not being able to do a 90-degree turn. When it comes to selecting the best fifth wheel hitch, there are several things which you will need to consider. I hope this guide helped in explaining all the best options with their pros and cons so that you can make your independent selection. If you cannot find your option, then get onto Amazon as there are a variety of them there. Use the guide to determine which one might just work for you. My best pick is Andersen 3220 5th Wheel Connection, check it out.